At least two posters proclaiming “It’s okay to be white” were found Thursday at American River College. 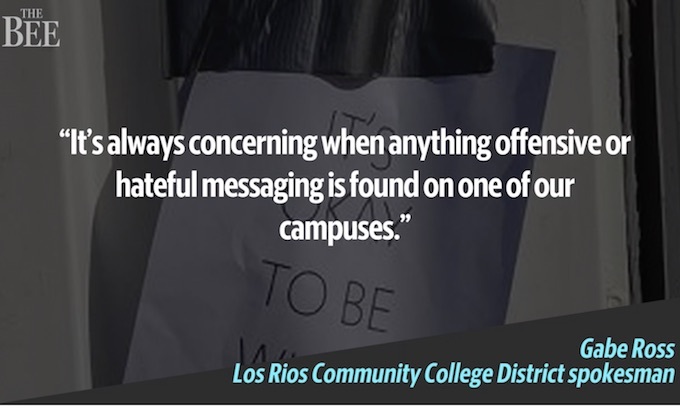 Los Rios Community College District spokesman Gabe Ross said maintenance staff spotted some fliers with the slogan at about 1:30 a.m. and reported them to campus police. They were immediately taken down, Ross said, though student paper American River Current reported finding additional signs later in the morning. The signs appeared to be printed on standard letter paper and did not include imagery or color. They were found outside the football stadium and near the door of the campus gym, the Current reported. The “It’s okay to be white” phrase was spread through an organized campaign beginning last year by users of 4chan, an anonymous online chat forum known for its controversial and often incendiary content. Users on that site came up with the slogan as a prank meant to garner reaction from both those on the left and right of the political spectrum. The pranksters allegedly put signs up at various locations around the country, sparking outrage from some who associated the phrase with white nationalism, and a defense of the phrase from right-wing commentators and others. Since then, the slogan has become more closely associated with white nationalism. Similar posters have been found at other college campuses in the country. This week, signs with the slogan have been found at Duke University, North Carolina State, University of Delaware, University of Vermont and others, according to media reports. The American River posters were found just weeks after racist graffiti was discovered in the mens’ bathroom at Sacramento City College, another Los Rios Community College District campus. Photos posted on social media showed the graffiti included swastikas and racial slurs, with the words “Kill them all” written in the corner of one mirror. “It’s important to note we have no reason to think these things are connected,” Ross said. Maintenance staff and campus police are continuing to look for additional posters, Ross said. He did not know the total number of signs with the message found on campus. A representative of Los Rios Police Department could not be reached for comment, and Ross said he did not know if police would be investigating the incident further. The college notified the campus community about the posters Thursday afternoon, informing students and staff of increased custodial checks on campus facilities, and emphasizing that “hate has no home on our campuses,” Ross said. If the words “It’s OK to Be White” are now considered racist, the Fake News Media have won the battle and we might as well all go back to Europe, where free speech and free thinking have already been socially conquered” Just google Patrick Henry’s “Now is the time for all good men to come to the aid of their country” and all you get is “Come to the aid of their PARTY” The socialist media moles led by the high-tech millionaire Companies will not even let us learn our own American History. He also said “Give me Liberty or give me death”. All the liberal media can offer is the latter, if you are White and love your country. First take back your government, then take back your schools, and taking back the media will take care of itself. Can you imagine had the signs said “its ok to be black”.. WE wouldn’t be hearing one lick of how ‘incendiary” that is..
What? It’s not okay to be white? Not according to the left. Apparently not. Maybe they should have painted white letters on a back majority background and the White derangement syndrome might have abated. Apparently only White posters are worthy to be incendiary burned into black, a place where the white student snowflakes feel safe, unlike the dark streets of Obama Chicago Community organized neighborhoods of death where even the black Angels fear to tread. Certainly not, to libtards.. Just like its not ok to be a nationalist or male or conservative. It’s official. Whites are much more discriminated against than blacks or hispanics. According to some brain dead liberal morons… White’s can never be discriminated against. IN THEIR minds, since whites for years, have “traditionally been in power, while blacks have traditionally been discriminated against”, BLACKS can never discriminate against whites. When you have people thinking that so truly, that they say anyone who DO think whites have been discriminated against, should ‘go cry us a river for 300+ years, then come back to reality’, it makes me SAD that many of those morons, are probably VOTING. There is nothing hateful about these signs! It IS okay to be white. And even if there are a few white people who don’t think it’s okay, what are they going to do about it? I think the next step should be~~ White Lives Matter along with Unborn Lives Matter. I’m sure that if the sign read: “Black, and proud of it” there would not have been the least bit of objection. These useless colleges need to be shut down.. All they are doing is brainwashing our younger generation. Its not just colleges though. IMO ITS Every step of public education, from kindergarden on up. It actually starts in Pre-School. Police involved with removing the signs while the only controversy surrounding all the Che Guevara posters and shirts is if someone talks ill of the SOB. Get real, you coloured racists! If it’s not OK to be white, it is not OK to be black, brown, yellow, red…let alone green with purple polka dots. Not surprised since it has become painfully obvious that in order to shamefully pander to black and brown minorities for votes, the white Dem politicians and their white cohorts in the propagandist media must act as if they are sincerely sorry and embarrassed to be white. The only white people who are now considered to be “okay” are those who are both hard line Democrat and who are willing to publicly attack, degrade and demean any and all other whites who don’t march in sync with the Democrat party line. We are now seeing a Dem Party so consumed with grabbing power that they frantically make promises of “free everything” that even the most gullible person must know are just deliberate in-your-face dirty lies. The most repulsive and devious tactic of the Dem politicians to garner votes is their all out effort to keep importing and bestowing unearned citizenship and voting rights for millions of impoverished uneducated foreign nationals who expect a Dem led USA govt to provide the cradle to grave welfare that the corrupt liberal elite socialist run govts they deserted had promised and failed to deliver. Proud to be WHITE and STRAIGHT ! Proud to be white, Straight, Male and CONSERVATIVE! We white people shouldn’t have sat by quietly while the white-haters built up a system against us. Now it’s going to be hell to clean the mess up. Anyone who thinks, “It’s okay to be white”, is an incendiary statement needs to be exorcised. Any person that thinks “It’s Ok To Be White” is a “Hateful Message”, is clearly an idiot ! The truth is that White people are constantly being criticized today for simply being white, and we are getting tired of it . And can anyone imagine what the world would be like IF WHITE FOLKS didn’t exist? Just think how much worse we’d be off.. The crusades would have not been fought and the muslim take over of europe would have gone unchecked. No Renaissance period. No industrial revolution. No modern tech..